Think of this as a warning. "Grab a cuppa..." as my friend Edie would say... this is going to take a little while. By r0ssie -- Mutant Quilting and the Process Pledge. By Naptime Quilter -- Throwback ~ A Digression. R0ssie's post about describing the process each of us takes for making the quilts we make is what really stuck with me because... gee shucks, that's what I'm always asked about. It's probably the most frequent question ~ how does the idea for a quilt come about? My answer is usually about the same... "Uh... I dunno." The process isn't always the same. Some quilts evolve while others are "birthed" fully formed without having a single change made from the original idea. Sometimes the starting point is a single block while other times I start with one element and then figure my way around the rest of it. The idea for the flying geese border came first when I made Toulouse, then I had to figure out what to put in the middle of the quilt. No, I don't "design" on the computer. I don't have EQ6 or EQ7. I think the last one I bought was v. 4. It's a terrific program and I totally understand the appeal of it but that's not how my brain works. Every now and then I will draw something on the computer to play with a block layout or perhaps a color placement, but it is definitely the exception and not the rule. I use pen/pencil and paper. Any pen. Any paper. Okay, I do have a few preferences there but nothing very impressive. I love the Moleskin Journals ~ plain paper or grid in either black or that brown paper bag sort of one. I also love the Greenroom products from Target ~ the quality of the paper is terrific and I just like the look and feel of their notebooks. I also use old-fashioned Composition notebooks from the office supply store ~ I particularly love those with the grid paper from Staples. Just so you know, I used my Xyron thing to put an adhesive back onto a piece of pretty wrapping paper to recover my notebooks ~ I've even photocopied my favorite fabrics for this sort of thing. It takes me about ten minutes to do a couple of notebooks but the time is well worth it. And those are my pens of choice ~ a regular ballpoint ink pen (though these Pentels are my favorite because of the pretty colors) and the Extra Fine and Ultra Fine point Sharpies. I know. I'm so cutting edge. The idea itself doesn't often become a sketch until I'm writing the pattern. Once the idea starts coming about, I usually start making some notes to remember the setting and a couple of specifics, but that's about it. A real picture of the quilt doesn't usually happen until I'm doing the diagrams for the pattern. The only part of Heartland that I drew out ahead of time was the setting ~ mostly so I would remember how many setting triangles I had to make. This is where the process part of it gets a little hard to describe so bear with me ~ or abandon ship while you still can still wade safely to shore! I have been wanting to make another log cabin quilt for a little while but I also didn't want to make a "log cabin quilt". Many years ago, I saw a Delectable Mountain block made using a log cabin block for the large half-triangle square part of the block and it stuck with me. When I decided to make this quilt, I already had the color scheme and fabric in mind ~ red, white/cream and blue using my big pile of Minick & Simpson fat quarters. That was the easy part. I had to start thinking about the size of the block to make. This is where the computer might come in helpful, but seriously, this isn't how my brain works... all logical and orderly like. I do all of this in my head ~ usually while I'm working on something else, driving to the printer or work, trying to fall asleep (which is not when I'm driving), blow drying my hair (which probably explains my hair somedays...) and so on. If I make the half-triangle squares to finish at 2" x 2", then my blocks will measure 8" x 8" or 10" x 10" finished, with a 6" x 6" or 8" x 8" finished log cabin. Given the diagonal measurements of those blocks ~ about 11.3" and 14.1" ~ that would make my quilt about 68" x 68" or 84" x 84" for 60 blocks. The 10" block has some appeal. Or if I make the half-triangle squares to finish at 1 1/2" x 1 1/2", then my blocks will measure 7 1/2" x 7 1/2" or 9" x 9", with a 6" x 6" or 7 1/2" x 7 1/2" finished log cabin. Given the diagonal measurements of those blocks ~ about 10.6" and 12.7" ~ that would make my quilt about 64" x 64" or 77" x 77" for 60 blocks. The 9" block is the winner here... even though it means at least 120 more half-triangle squares. Before I decide, how am I going to finish the quilt? Is it going to have a border? What kind? Or will I do something with the setting triangles? If so, what? In thinking about the quilt, I decided that I wanted a simple finish on the edge ~ which meant I wasn't going to add a separate border. I don't think every quilt needs one. So this is what I came up with ~ and this is the part I actually drew out in my notebook so I would remember how to piece it and, more importantly, how many setting triangles I would need to make. To get it to work, you actually have to piece half the setting triangles one way and the other half the reverse direction. On a side note, by piecing setting triangles like this, you can add something that looks complicated but isn't. How much trickier would this have been if I had used a plain setting triangle and then pieced the sawtooth border and fit it on the quilt? This way is so much easier. After deciding on how to finish the quilt, I knew that this would add a couple inches to the finished size of my quilt top. How much it added would depend on the size of block I used ~ anywhere between about 3" and 5". The other factor in deciding which size block to use was proportion ~ how much of each "color" did I want to use in the quilt? If I used the 6" log cabin blocks ~ the red was going to be a bit more dominant than the blue and the cream in the log cabins, regardless of which size half-triangle square I used. And to make the quilt bed-sized, that would have required making a lot more blocks. A lot more... especially half-triangle squares. Deciding between the 10" x 10" block made with the 2" x 2" half-triangle squares and the 9" x 9" block made with the 1 1/2" x 1 1/2" half-triangle squares was pretty easy. And no, it wasn't because there would be more half-triangle squares for you to make with the smaller block. That was just one of life's little gifts. First, the 10" block was going to be more difficult to divide evenly for the setting triangles. Five seams. Prime number. Five rows in the setting triangle? Do-able ~ there are only 24 setting triangles. It makes the finished quilt about 88" x 88". Another option is to divide the setting triangle into two rows ~ that makes the finished quilt about 92" x 92". I didn't like that idea at all because it will make the sawtooth border too "heavy" for the rest of the quilt as the proportion would be off. That is also why I kept coming back to the 9" x 9" block. Proportion. Balance. I liked the balance of the smaller half-triangle square to the rest of the block. In addition to keeping the blue and white/cream a little more prominent, the larger half-triangle squares were "heavier". I wanted them to be a strong accent but not the focal part of the block. Using the smaller half-triangle squares also helped me decide to use just one background. And that made it easy to choose to use that same background for the setting triangles. After all that, making 600 half-triangle squares didn't seem like that much work. And neither part was as much work as reading all of this was. But there you have it ~ the process I went through for making Heartland. It's been quilted and bound ~ in blue ~ and it's been getting it's picture taken this past week. The finished pattern should be ready to go in about another two weeks. I'm off to work on Eventide ~ hope to have it done by early next week so it can be quilted, bound and photographed too. That one came about in a very different sort of way ~ the idea for it came from the fabric, Luna Notte by 3 Sisters. If you would like to read about my "process" for that one, just let me know. Can the mail be bad for you? And then I didn't get anything done after that. I read it cover to cover a dozen times. Unless you want to be the proud owner of a new commercial baking rack, don't even think about perusing this issue. (Page 4. Gee, thanks, Jennifer.) There are four gorgeous sewing rooms to drool over and lots and lots of gorgeous quilts. I'm also in love with this quilt by Tara of Sew Unique Creations. Tara's quilts are always gorgeous ~ if you don't believe me, check out her patterns ~ Sew Unique Creations. They're terrific. And so, by the way, is she. Never mind "marketing genius"... she's just plain all-around brilliant. And now she's making "work" for everybody! Can I see a show of hands of those people who don't want to make this quilt? As someone who has started a trillion granny squares with the intent of making a crocheted afghan, I really like the idea of making a quilt instead. I might still make a mess of it but at least I've got a fighting chance... instead of 12 miles of knotted yarn. It's a brilliant idea and a really beautiful quilt. And I think I have enough scraps to make this without buying more fabric... maybe. Once upon a time, Jan owned Quilter's General Store in Rockford, Illinois. She sold that years ago and after just quilting and playing around for several years, she's now part of Acorn Quilts in Rockford. She's done patterns under the name Penny Candy and has published several beautiful quilts with American Patchwork. The first thing that always catches my eye with her quilts is the amazing color. It's official. Pat doesn't sleep. Either that or she's figured out that cloning thing and she's keeping it a secret. It's probably both. Her clone doesn't sleep either. And then there's the last page article about the Creative Circle of Excellence. It's amazing to think the folks at APQ were able to squish so much talent into one picture on one page! The wonderful Monique Dillard of Open Gate Quilts was there. And the Happy Zombie ~ Monica, Terry Atkinson, Lynda Hall ~ she of the Primitive Pieces, Bettina Havig ~ who I met in Columbia, Missouri last year, Julie Hendricksen ~ the lovely owner of JJ Stitches in Sun Prairie, Wisconsin, Sherri Falls of This 'n That and lots of others. I volunteered to carry bags and schlep stuff around but there weren't any takers. Oh well... maybe next time. Whatever you do, don't miss this issue. And if you see it on a newsstand somewhere, buy an extra copy. You'll need it... the first one is going to fall apart really fast. Maybe two extra copies... just in case. You won't see anything like this in Phoenix. Maybe in January, but probably not. After getting home from a wonderful trip to Minnesota ~ great weather and not a mosquito to be seen ~ I get home, I'm getting caught up and then my computer goes haywire. Completely nutso. Red spots... seriously! The good news ~ with external hard drives and flashdrives, everything was backed up. Someplace. Minnesota. If you've never been there ~ it's beautiful. If you have been there ~ it's still beautiful. If you live there ~ lucky you! Even the weather was perfect. When I flew in on Wednesday, it was starting to rain and oh my gosh... the humidity. Sticky doesn't even begin to cover it. My sunglasses fogged up when I put them on. The windows on the rental car fogged up when I turned it on. But then it all stopped... and kind of went away. That was the only day with any discernable humidity. I think the weather gods decided to take pity on me, after all, we'd been having very hot weather the week before I left so I deserved a teeny tiny little bit of a break. This is what I was blessed with most of the time I was in Minnesota. And yes, I cropped the picture so you wouldn't have proof that I wasn't completely stopped when I took this picture. Gotta love auto-focus. After picking up my rental car, I went in search of some trouble adventure! It was right before closing time so I didn't want to keep everybody waiting while I took pictures inside the shop so you'll just have to trust me that it's a beautiful shop filled with lots of fabric, kits, wool, stitchery and cool stuff. It's all about the "local color". I was there for the Log Cabin Quilters Quilt Show ~ their first quilt show. The guild did a terrific job with the show ~ lots of gorgeous quilts, several clever and unique displays and a host of excellent vendors. The show itself was in the John Glas Fieldhouse on the Bemidji State University campus, on what had been the floor of the ice hockey rink. There are many amazing quilters in the guild, several of whom were the focus of a "spotlight" showing of their quilts. The four corners of the floor were arranged in "seasonal" displays of quilts ~ Spring, Summer, Fall and Winter. I did two classes in Bemidji ~ the new pattern Heartland and Moose Munch/501 from the Spice of Life book. I met lots of terrific quilters and all-around nice ladies, including a big group who had come from Canada! It was less than two hours drive from Bemidji. Pretty cool, eh? (That's for my Canadian friends... and yes, a Maple Leaf Tuffet will be coming soon... just for you.) And then there is my new BFF Shelly, Arden ~ who groans every time she thinks of "Heart and Souls", Sheila ~ who sews with her Pfaff presser foot upside down, Sherry ~ who kept asking if I had gotten a picture of Paul and Babe and... you get the idea. The highlight of the show was a person ~ Evelyn Nall. Can you believe that I actually bailed on my class for a few minutes on Saturday so that I could go see a little bit of Evelyn's "bed turning". Evelyn was born and raised in Tulsa, Oklahoma and now lives in the Minneapolis area. A "bed turning" is when a bed is stacked with dozens of quilts ~ usually in some kind of chronological order ~ and then "turned down" while the story and history of each quilt is told. If you get the chance to see/hear Evelyn, I think you'll enjoy it. Evelyn is funny, sweet, charming and she's a world-class hugger. If nothing else, you have to hear the story about the quilt Evelyn wants to be "wrapped in" for all eternity. Her daughters ~ the two lovely ladies in the picture ~ have a different plan in mind. It's hilarious. Bemidji is also the home of Emily's Country Cottage. I had to go by on Sunday morning to get this picture. When I was there on Friday afternoon, there were 12 million cars parked out front... it was kind of busy. The shop is a lot of fun ~ lots of little rooms all filled with beautiful fabric, kits, samples and "stuff you can't live without." On Sunday, I drove to Waite Park, Minnesota, home of Gruber's Quilt Shop. Above the door, it says "Be prepared to be overwhelmed!" I was at Gruber's for a Christmas Dinner on Sunday and then a Schnibbles class on Monday. I get to meet the nicest ladies, starting with Sue Poser and her amazing family/staff at Gruber's. The funny thing was that while Sue mentioned that it was hardly the appropriate weather for a Christmas dinner, it wasn't that different from what I'm used to here in Phoenix. Shorts and flip-flops aren't all that unusual in December. I met Melinda and Shirley, Mary Ann and Vicky, and Kathy who came with her daughters Joleen and Jen. I know I'm forgetting lots of really nice ladies so I hope they'll forgive me... my memory isn't what it used to be. One last thing... after spending over $100.00 to be prepared for the swarms of killer mosquitoes I had been warned about, I didn't see a single one. And no bites. I think they knew I came prepared. Now if I could just get rid of the couple of mosquitoes bothering me here just as easily... grrrr. And if everything goes according to schedule, I will get the attern covers for Short Line, Times Four, Route 44 and Ashcombe by Tuesday. You know, I might get caught up sometime this year after all. Don't let this fool you. This is a very dangerous dog. She is quite unique ~ a very rare killer, attack Golden Retriever. She's been trained to guard the premises with her life. Or yours. She is particularly territorial when it comes to closets. Special closets... "magic closets". And jars. She's very protective of jars. They might be filled with treats. Her treats. Did I mention the alarm system? I'm off to the lovely land of 10,000 lakes... which probably explains all the mosquitoes I'm being warned about. The size of hummingbirds? Yikes. At least 10,000 lakes will be better than 10,000 degrees, right? I'll take lots of pictures and when I get back, I'll finally get around to telling you all about the new patterns (which are finally going to start shipping), the fabric, what's still coming and yes, my workroom. This is the cabinet where I store all the little Schnibbles quilts when they're home. It's just wide enough that I can roll the quilts in groups of four or five and put the roll on the shelf. As you look at the picture, my Ikea wardrobes are to the right and the table with my sewing machine is to the left. The Jolly Jabber! Make sure you go enter the contest before next Monday ~ July 19th! Two Lumiere de Noel Layer Cakes and the inner border yardage. Have you left a comment at The Jolly Jabber? I'll wait while you do. I'm off. I have to finish packing. And get Rosie some fresh meat. If she'll get off the couch. It's Portugese for "good day". And I had one today. It was just one of those days that, at the end of it, you just feel happy and content. A friend came to visit. We laughed. Talked. I made lunch. (Okay, I cheated on that a bit and made my favorite Chinese Chicken Salad from Costco.) Visited some more. Laughed some more. Solved the problems of the world... or at least the quilt problems. Talked about fabric. And so on. Of course, I think she only wanted to see what I jokingly called "the magic closet." If you want to know what that is, you'll have to let her tell you about it. How cool is this? Darlene knows of my fondness for large storage jars. But this is the coolest. It came with treats for Rosie ~ Darlene knows the way to her heart too ~ but I have already appropriated this for my workroom. It's now officially been re-purposed. I had these spools in another jar but I like this one better. This came with treats for Mom and for me. Those are now residing in the "regular" treat jar because this jar is mine. I've been busy packing and getting things ready for my trip to Minnesota next week. I'll be in Bemidji with the Log Cabin Addicts and then in Waite Park at Gruber's. I'm looking forward to seeing more of Minnesota... but I am also just a little bit worried. As soon as someone familiar with Minnesota and Minnesota summers hears that I'm going to be there in mid-July, the first thing they say is... "oh, gosh... the mosquitoes will be huge by then." Just how big are those mosquitoes? Is this one of those things where I'm going to need a helmet of some kind? I've got Off. And some Avon Skin So Soft. One of those Off clip-on things... I've got that too. And anti-itch cream... just in case. I'm ready. I think I'm covered... wish me luck. 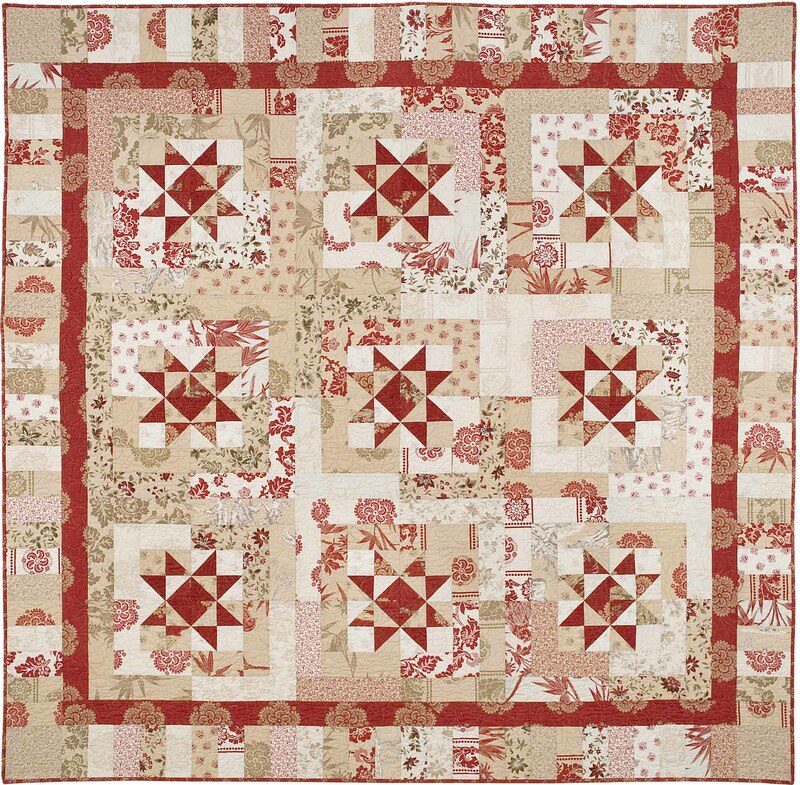 This is one of the new quilts ~ Heartland. Red, white and blue. All Polly and Laurie ~ assorted pieces from Prairie Paisley, American Primer, Hampton, Wiscasset, Flag Day Farm and Bar Harbor. It's at the quilter right now and it will get it's official picture when I get back. And don't forget to leave a comment for Polly and Laurie ~ they're having a giveaway! Speaking of giveaways, how would you like to win a signed Schnibbles Times Two book? I met Kelly Jackson at Market and despite her having all sorts of people to see and places to go, she waited in line to have a book signed so that she could do a giveaway. In addition to her terrific blog, Kelly has an online quilt shop, I Have a Notion. If you leave a comment at the I Have a Notion blog by midnight on Friday, July 9th at her blog, you could win a book signed by moi. Don't forget! And after reading all of this, you can read more on The Jolly Jabber. I don't know exactly when it will be up but you won't want to miss it... well, you might but check it out anyway. Just skip to the end and leave a comment as there is another giveaway ~ a kit for Lumiere de McGuffey. And that's it for my day ~ I hope you're having a bom dia wherever you are. And that your weekend is the same. When I clicked the link to write a post, Typepad basically said "...and you are?" Which kind of explains the past two weeks. I feel a little like Rex, just running on the wheel in my cage. Running and running... but not really getting anywhere. And the view hasn't changed. I finally picked up some of the new Schnibbles pattern covers on Thursday and my Mom has been busy packing patterns ever since while I've been... what have I been doing? Catching-up. Running and running... and still behind. Just maybe not as much. I've been finishing up writing the last of the new patterns, proofing covers, drawing diagrams, getting in a little bit of sewing ~ but not nearly enough to make me happy, getting quilts organized to ship off next week and so on. It's pretty boring stuff, actually. But it makes for a really, really good reason to stay inside... it's way too hot outside. Speaking of Schnibbles... there are a whole slew of really good "old' "new" ones ~ "new""old"? ~ over yonder in that parade thing. The Year of Schnibbles is having a State Fair! And what would any State Fair be without a few prizes? Or would you rather have some big cheezy stuffed animal? This is better. It's prettier. And I know you'll have a lot more fun with it. It's 12 Days of Christmas by Kate Spain. From Sinta's parade ~ Di of Quilting is Blissful made a beautiful pink State Fair. Di's an over-achiever, she's already quilted and bound her quilt... okay, color me just pink with envy. From Sherri's parade ~ Regena of Quilt 'n Quilt Things. Grrrr... another over-achiever. Not only is Regena also quilted and bound, she made her quilt bigger! Di and Regena ~ if you'll leave a comment here, I'll e-mail you to get your mailing addresses so I can get a Layer Cake and a Joy Luck pattern on the way to you! And for everyone else waiting for Joy Luck patterns ~ they started shipping yesterday to Quilt Taffy, Quilter's Paradise, the Fat Quarter Shop, and Havasu Quilts. I think that's everything... what? Rex? Stephanie's hamster... Stephanie Plum? I know a few of you have read all, most or some of the Stephanie Plum books. Have you read the latest one, "Sizzling Sixteen"? All I have to say is "not my favorite". And have you read that the movie "One For The Money" has been cast? I've liked him in "Rescue Me" so I can live with this one too. And really, The Rock is too old and other than the eyebrow-thing, I think of him as more of a celebrity than a real actor. Is he Italian? No. But I'm not going to hold that against him. I am probably in the minority on this one but I think this is a terrific choice. I've liked him in everything I've seen him in, even when he plays a not-so-likeable character. Aside from being dishy enough for Morelli, he's always interesting and you know there's something going on in his head, as in he doesn't need to try and fake "smart". (I loved him as Bill on The Closer.) And I'm open to him as Morelli mostly because I can't think of a single actor that I would like better. And as much as I love Betty White, I would rather see someone else as Grandma Mazur. Cloris Leachman? Probably. But it's been that kind of summer. And now it's July... almost July 4th. Happy 4th of July to everyone ~ may your holiday be safe, happy and very, very sparkler-y.